Last year the residents of Middle Barton came up with an ingenious solution to the problem of transport cutbacks. They started their own bus company. Last week they celebrated their first birthday. 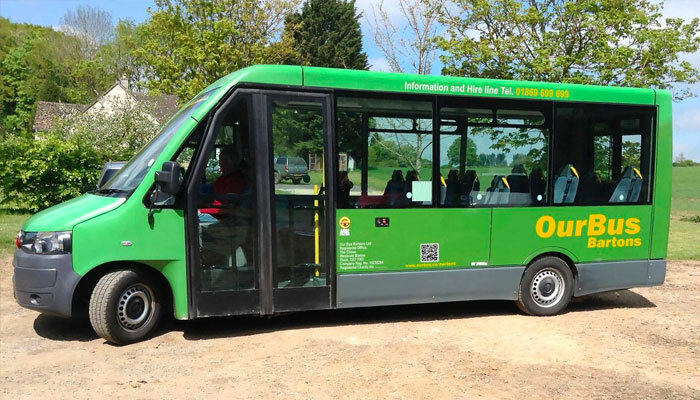 Our Bus Bartons was established in 2016, operates as a registered company and registered charity and provides timetabled Community Transport links within a 15 mile radius of Middle Barton on a Section 22 Permit. It was started by a group of dedicated volunteers responding to cuts that left the local community without public transport. The Company and Charity is run by a management committee of 10 officers, directors and key volunteers. The company provides a scheduled weekday bus service along seven routes linking the local community with transport hubs in larger villages, health centres and supermarkets. The scheme is increasingly successful and has just purchased a second bus. Fares are £3.00 for adults, reducing to £2.00 for concession card holders and children pay £1.50. It is also possible to purchase a multi journey Barton Pass ticket of 10 or 20 journeys. The vehicles are also available to hire at weekends. Local resident John Madden, a member of the Banbury Chamber through First Line, the company he co-founded, has brought the scheme to the attention of the Chamber as an exemplary model of what can be achieved by an enterprising, self-help attitude. Absolutely. Nick Poole, Chair of Banbury Chamber said: “Banbury needs more of this; the surrounding villages which make up Banbury’s catchment would clearly benefit from more schemes such as this. This is a highly enterprising and laudable solution to a widespread problem. What better than to find ways of bringing people from our surrounding villages into the town centre? This is a win-win for everyone”.